Mathura, the land of Lord Krishna, is known not only for its sagacity and preaching of the thesis of Bhagwad Gita, but as much for his childhood frolic and the pranks that he was famous for playing on his foster mother and mates. 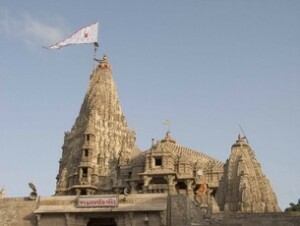 Braj Bhoomi is the land, which gave birth to Lord Krishna and where he spent his early years. And thus the history of Braj Bhoomi and Lord Krishna weaves around its capital, Mathura and its environs. Situated on the western bank of the Yamuna, Mathura’s history dates back at least to 600 B.C. and many archeological remains have testified to its importance over the ages. Mathura and Braj Bhoomi region are important for the festivals centering on Lord Krishna and his consort Radha Rani, which are distinct to the area. These include Holi, Janmashtami, Radha Ashtami, Kans Vadh, Yam Dwitiya and Hariyali Teej. Air: The nearest airport is Kheria airport and Agra 62 km from Mathura. Rail: Mathura is an important railway junction with connections to all parts of the country. Road: On National Highway No. 2, Mathura is well connected to all parts of the country with goods roads. UPSRTC bus services connects Mathura to all major centers in the region like Agra, Delhi, Lucknow, Bharatpur, Kanpur, Haridwar and Jaipur. There is a regular bus service between Mathura and Vrindavan. This entry was posted in Mathura, Uttar Pradesh and tagged Holy Place. Bookmark the permalink.